Will Viper Room’s Menswear Line Sing with Music Lovers? Like an edgier cousin of the Starbucks mermaid logo, the Viper Room’s curly-tailed mascot, cigarette in hand, is emblazoned on many of items in the club’s new menswear line. 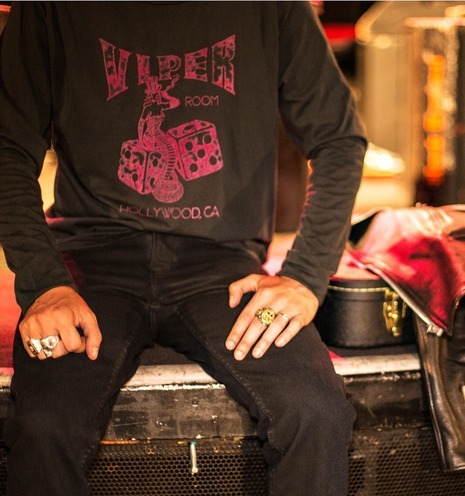 The Viper Room is launching a line of menswear in celebration of its 20th anniversary. The menswear line was launched in honor of the Viper Room’s 20th anniversary, and indeed it screams (or sings, given the venue’s musical heritage) “20 something.” Will the fake-vintage washing of its tees and skinny jeans help the brand appeal to the young hipster set? Or will the prominent business name and logos make the duds feel too corporate? And will the “signature guitar picks” sewn into the labels lend the shirts a feeling of authenticity—or will they just be a pain in the neck? The Viper Room calls the style “rock-n-roll couture,” and says that the line “captures the historic rocker style and history of the famed location.” In a nod to the Viper’s musical heritage, the T-shirts will be packaged in “authentic vinyl record covers,” though the Viper Room’s website makes no promises about the genre or popularity of the music once packaged in it. $78 for a douchey t-shirt. HA! no thanks.